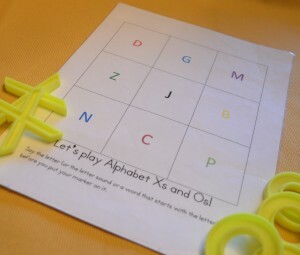 Alphabet Activities, Games and Books to Share with Kids! 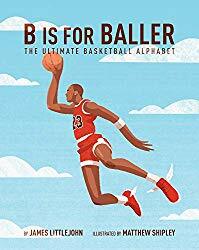 My book is “B is for Baller.” It’s a must for parents who love basketball and want to pass that love of the game along to their kids. I’m most proud hearing from parents who’ve told me it’s sparked conversations with their kids about players they grew up watching. Too many favorites to name, but Roald Dahl stands out. Loved the humor in his work. We successfully launched “B is for Baller” on Kickstarter before finding a publisher, and I think the positive response we got from crowdfunding helped the publisher see its potential. That said, “B is for Baller” wasn’t my first, second or third book — those ones still haven’t been published and likely never will be. So yes, it is difficult! If becoming an author or illustrator is an aspiration of yours, I think you have to accept that rejection is inevitable. There are too many talented people, and too few opportunities, for everyone to succeed at once. I enjoy the creative process — coming up with new ideas and seeing those ideas come to life on the page is really satisfying. What are the biggest challenges of being an author? Other than finding a publisher… probably trying to write your own bio. I work full-time as a writer at an advertising agency. Keeps me creatively engaged, but also requires me to think a lot about marketing — skills I need and use often making and selling books. James is available for school or library presentations. He is based in Los Angeles. B.C.R. Fegan is a multi-award-winning author who has written a number of fairy tales and fantasies for children and young adults. Raised on a small hobby farm only minutes from some of Australia’s greatest beaches, Fegan grew up inspired by the power of nature’s ambience. From the intensity of the frequent summer storms to the overwhelming serenity of a lonely beach in the early hours of the morning. His ravenous appetite for both reading and writing soon saw him drawing on the transformational influence of the world around him to craft short stories, poems and picture books. As time wore on, Fegan also found inspiration in the magic and depth of authors and compositors like Hans Christian Andersen, the Brothers Grimm and Charles Perrault. He was mesmerized by the potency of small but beautiful phrases that were carefully carved from the minds of Samuel Taylor Coleridge, Alfred Lord Tennyson and Robert Frost. He grew to appreciate the worlds meticulously created by David Eddings, JRR Tolkien and CS Lewis. Eventually, he began to forge his own complete works. Weaving his own magic, piecing together his own phrases and crafting his own worlds. Agonising over plots that would inspire, characters that would be loved and circumstances that would delight. In time, his efforts saw a number of children’s books and young adult fiction produced. My latest book is The Day That A Ran Away. It’s an alphabet book that follows the excuses of young Master Jet as he tries to wriggle out of not completing his homework. My overriding focus for the story was to turn a traditional alphabet book into something that was a little more memorable and exciting for both the child and parent. I hope children who are beginning their journey into reading and writing will find the simple rhymes and colorful letters helpful in that journey. Older children and parents, on the other hand, may actually enjoy reading or listening to the story too, as there are a number of deeper layers that I hope will hold their interest. I think what I’m most proud of about the book is that there is so much learning packed into it without it feeling overbearing. 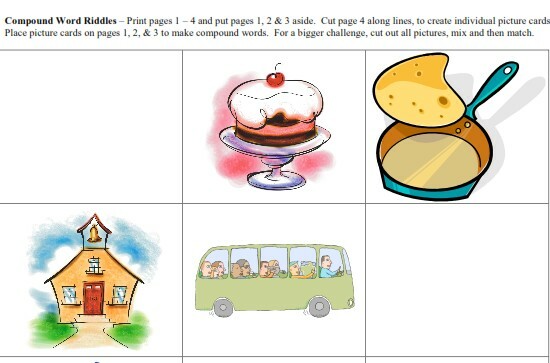 Of course, the primary learning concept is the alphabet, but it also introduces the concept of homework and every page contains a number of ‘Easter eggs’ for children to find. All of which has great learning value. Thinking back to your own childhood, is there a particular author or illustrator who was a favorite? Why do you suppose that person’s work resonated with you? 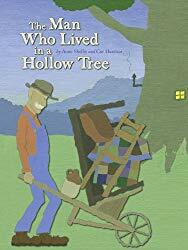 It’s an interesting question because I read so many picture books as a child, but early on I didn’t really make the connection between the story and the writer behind it. To me, it was simply a great book! I probably had a number of favorite authors without realizing it. When I eventually made the connection however, I was right into Graeme Base’s book ‘The Eleventh Hour’. Here was a book that wasn’t just a simple story, but was this spectacular maze of ideas and images to pour over and get lost in. It was actually a very clever book and as I soon found out, so were his others! I think what I loved most about Base’s work (who is both an author and an illustrator), was that he built so much into the book. 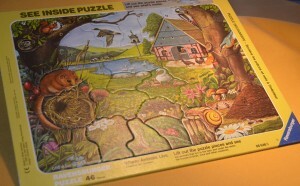 You could spend hours on each page – looking for clues, finding hidden objects and simply enjoying the artwork. 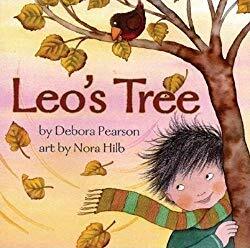 I think his books really cemented for me two important things: Firstly, the connection between the text and the illustrations need to be more than complimentary, they have to elevate each other beyond anything they could do alone. Secondly, you want a narrative that pulls you along quickly, but with enough depth that you could just as happily dwell on a single page for hours. When did you realize that you would be a writer? Is there a particular person who has inspired and/or supported your work along the way? I think I realized early on in my life that I wanted to ‘write’. I may not have quite grasped the idea that I could turn it into a vocation, but for almost as long as I’ve been reading, I’ve been writing too. When I eventually made the decision to begin publishing my manuscripts, I had incredible encouragement from my wife. She has continued to be an amazing pillar of support ever since, and I’m sure I wouldn’t be anywhere close to where I am as an author without her. There are so many! In fact, I enjoy almost every aspect of writing – from the possibilities of a blank page to the satisfaction of a completed manuscript. However – without a doubt – the greatest pleasure comes from the feedback I receive from children and parents who have enjoyed the book. It’s a little bit surreal when you hear children dressing up as characters from your books for World Book Day; or hearing parents talk about your books as their child’s favorite. It’s also those moments you hold on to when the occasional bad review threatens to dampen your day. Only trying to swim in a surging ocean of marketing ideas and publicity essentials. I think I’m not the only author who wishes they could spend more time on writing and less time trying to gain exposure. Unfortunately, it’s simply a part of the business these days. Does music play a part in your writing? If so, what sort of music do you connect with your work? It does sometimes. Given the choice, I’d prefer to listen to the rain or the wind outside while I write. Failing that, I might listen to recordings of storms to provide the right atmosphere (I know, sounds strange right?). However, I also don’t mind classical music on the odd occasion to play alongside the thoughts in my head while I furiously try to keep up with my pen. 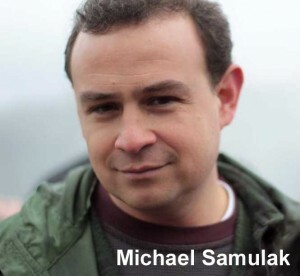 Michael Samulak has almost twenty years of experience teaching, mentoring, and engaging youth both in and outside of the classroom. 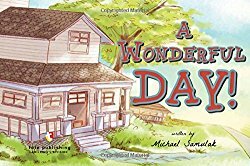 Mr. Samulak visits schools, learning centers, and daycares to read and present his stories and world adventures. His goal is to inspire youth to dream big. 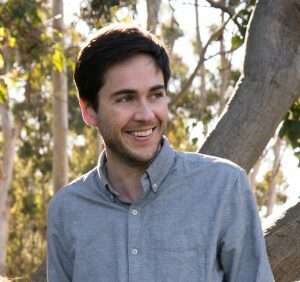 Michael’s teaching and classroom experience help him to fill his award-winning picture books with fun opportunities for learning. Michael resides in the City of Cleveland, Ohio with his wife and four children. He earned his Bachelor’s degree in Elementary Education from Michigan State University (’96) and finished his Master’s in Education at Cleveland State University (’12). 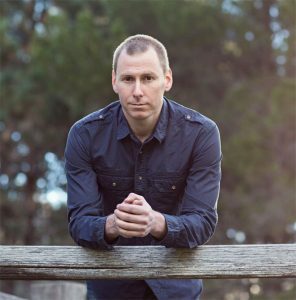 He has been working as a full-time youth minister and educator for close to 20 years. A Wonderful Day! is my latest picture book about going to the zoo. This is actually my first traditionally published title and I am so excited to be able to share it with everyone! 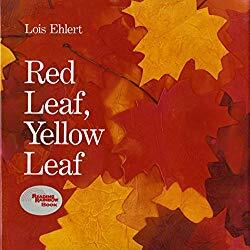 It is an early reader, great for emerging readers, or those who are working toward fluency and need that extra support from a fun book that can reinforce those early sight words and phonics skills that they have been working on. I generally recommend a target audience to be 3-6 years old, but as many of the educators and parents will tell you, this totally depends on your reader. My nephew is 2 and he loves to make all the animal sounds as he flips excitedly through the pages. My brother sent me a picture of him sneaking a read after he had “thought” he put him to bed. He was “reading” under the covers, flashlight and all. I couldn’t have been more happy to see someone getting that kind of joy from one of my books. I am probably most proud of the way the book has been put together with little learning moments laced throughout the manuscript. Besides being written with a gender-neutral text, you also have a good amount of questions and statements that can be thought-provoking and interactive. This kind of anticipatory exercise is very important for young readers as they are learning and beginning to understand that text has meaning. I love that the book helps young readers make text-to-self-reflections; putting their own experiences and prior knowledge front and center while reading in order to develop and expand the whole experience of reading. We all do this as accomplished readers, and generally forget that somewhere along the line we were helped to understand and realize that reading is so much more than decoding and applying the known rules of phonics. A Wonderful Day! 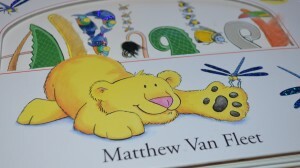 was recently Awarded the Gold Medal for Children’s Picture Books (Animals) by the Mom’s Choice Awards. This would have to be when I would ask my mom if I could stay home from Jr. High school, maybe about 6th or 7th grade so I could keep working on my first chapter book. I think that it is safe to say that I still consider myself to be a work-in-progress, and so it is crazy to think that my books can now be found in libraries, schools, and peoples’ homes. For those still-aspiring writers I always have the same words, “Don’t ever give up!” That choice has a guaranteed outcome. Don’t stop. Keep going, keep writing, keep up the inquiring: There is story that you have that the world needs to read. Keep putting yourself and your work out there and it will happen, even if it seems that things are tough or impossible, as long as you are moving and working on your dream, something can happen. If we were watching over your shoulder as you work on a book, what would we see? Where do you work? What does your writing process look like? Generally speaking, one of my five children climbing on my back or sitting in my lap. Don’t get me wrong; I love all of the kids. They are a big source of inspirations for many of my books, so I can’t complain, but finding that quality, uninterrupted time is tough. I am always writing, or at least thinking about writing. My note app on my phone is filled with bits and pieces, lines, thoughts: unpublished titles, I’m always trying to think of what may be a good title for a book. I think that has replaced a lot of my early days of notebooks, scrap paper, napkins from a dinner table, whatever was there really: Crayon, pencil, that piece of fruit my daughter had finished with…whatever worked to get that word down before it was gone. I’m sure some out there can relate. I suppose once it is time put all of those bits and pieces into something “final” that I then print out or send to an actual human being, my laptop and a local coffee shop are where I land. But, the process, yeah, that’s a lot messy for me. What hasn’t happened? Tears, fears, in appropriate laughing; farting, burping, teasing, and a lot of smiles and wide-eye stares that keep me coming back for more. I love reading my work and interacting with the children at schools and learning centers the most. I think it is the father and educator parts of me. I have come to expect the unexpected and it is this color and variety of the trip that make it so worthwhile. If I had to pick one particular event I am particularly found of, it would be that one I often remember this one time when I visited one schools and one of the students in the sea of faces piped up matter-of-factly after I held up my book, “Hey! I have that book at home! I love that book! Oh Boy!, this is gonna be awesome.” I had to take a moment to hold back the tears on that one. It was one of the first times that I really felt accomplished as an author: Like my dreams of being able to write for children were coming true. How do you stay connected with your readers? Have you gone on book tours? Do you engage on social media or through a website? Do you visit classrooms, libraries or bookstores? Everything goes when it comes to connecting, networking, and staying engaged with readers. So, yes to all! I love to network and feel that it is so important to staying relevant to my audience. I often will bring “finished” works to the schools and classrooms that I visit to get fresh feed back from the audience that I feel matters most – the one that I am writing for. I try to stay active on social media platforms, but since I write for a younger audience, like, they aren’t quite there yet when it comes to literacy fluency, let alone responding to a FaceBook post; I generally am reaching out and interacting with parents, other writers, educators, etc. on those platforms. With that in mind, I am generally looking for opportunities related to a visit or to network, or generally showing off my beautiful family and our recent life adventures together. Juggling work, family, wife, kids — oh yeah, and then there is writing. I would have to say time – quality time to get to the end part of that process of writing in order to cross that finished line where an actual tangible piece is produced that then can be reworked, critiqued, rejected, reworked again…really, do I need to go on. I know others may have other struggles, and I’m not at all saying that those aren’t real or deep, but for myself it would have to be finding the time to “gett’er done”. “Just keep swimming” often does become my own encouraging theme song on those days when I feel like throwing in the towel. And so I try to just keep moving, even if it is just one sentence or phrase that I can work on; not even finish per say, but to mark progress. Yes, seeing progress helps to keep me going and eventually cross that finish line. When I go to schools or libraries I love to read my picture books and share my inspirations and experiences that they are based on. Generally speaking, this makes for great laughs as I share my adventures with my children. I also have brought back some native items from Africa and do a sort of “Show and Tell”. The kids love to see and feel these native artifacts. The African Drum is usually the biggest “hit”. In this fascinating picture book, Amy Krouse Rosenthal uses only words that begin with A, B or C to tell her story. The day begins as a young boy awakens and enjoys Apples, Bananas and Cantaloupe for breakfast before heading outside and finding Ants, Butterflies and Caterpillars. He later celebrates at a birthday party, explores a city and appreciates an artist. Older children will enjoy scouring debut picture book illustrator Gracia Lam’s detailed digital illustrations for an apron, bowling pins, binoculars, a castle, a cape, a church (and more!) that serve to broaden the appeal of the story and support the development of phonemic awareness and alphabet recognition. 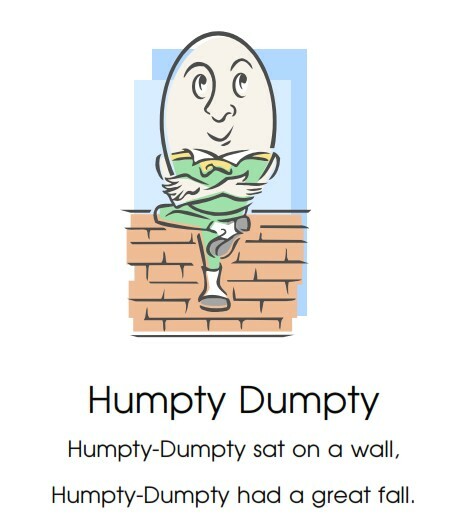 It is worth mentioning that Ms. Rosenthal and Ms. Lam do not limit the story or illustrations to the phoneme /K/, they also challenge readers to recognize the use of ‘C’ in words beginning with the /ch/ and soft ‘C’ sounds, as in church and city. the ‘A’ words that we detected use the short vowel sound. 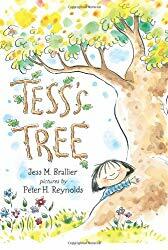 We envision this picture book as a wonderful inspiration to young illustrators and writers. 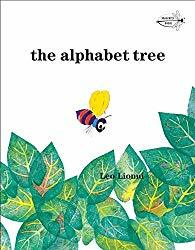 Great for classroom use, the clever take on the alphabet book genre could certainly be a jumping off point for children to create their own stories and illustrations using only two or three letters. This is a picture book that will be enjoyed by children aged 3 and up but that has great potential for exciting older children and adults. My youngest son has played hockey since he was five years old. For years, bedtime stories included books about playing hockey. Many of these stories include great messages about friendship, teamwork, bullying and working together toward a common goal. 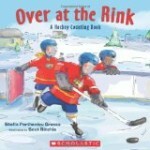 Hockey picture book published by Scholastic Canada Ltd. This is a favourite wintertime picture book that beautifully captures a Canadian winter day. Set in Saskatchewan, Owen and Holly are excited because Humboldt Lake has finally frozen over and it is a perfect morning for a spirited game of pond hockey. The two children are excited to drive to the lake with their dad and before long their skates are laced and the three are laughing and playing together. Unfortunately, just as the family starts to talk about taking a break and enjoying a mug of steaming hot chocolate, Holly smacks at the puck and it flies across the frozen lake and disappears into an ice fishing hole. The children are terribly disappointed that they’ve lost their puck and assume that the game will have to end. Dad is not quite so willing to concede. He helps Owen and Holly to find a fallen poplar tree near the lake. Once a suitable tree is found, dad saws a piece from the trunk to create a wooden puck and the hockey game resumes. Brian Deines’ luminous illustrations include icy cold winter scenes that are made warm by his depiction of the joy of playing a favourite sport with friends and family. A lovely book to share with young children, this is one of my favourite wintertime picture books. Danny, Petou, Anita and Marcel live in a small, prairie town and they love to play hockey. They play road hockey when the weather is warm and ice hockey when the temperature cools and their outdoor rink is flooded. Everything changes when a new team is organized for their town. The four friends can’t wait to be part of the fun. They are devastated when only Marcel is selected to play for the Wolves. Anita is refused a spot because she is a girl, Petou is considered too small for the team and Danny is refused a place on the team because his disability means that he cannot wear skates. All three children are terribly disappointed to be left out but, as the end of the hockey season approaches, the Wolves’ goalie is injured and the coach asks Danny to play. The Moccasin Goalie is the first of a three book series. The Final Game is the second book. Victory at Paradise Hill is the third. Gorgeous illustrations – many using a pointillist technique – beautifully depict the joy of outdoor wintertime play. The story itself invites discussion of fairness, friendship and overcoming challenges. Highly recommended for children five years and older. 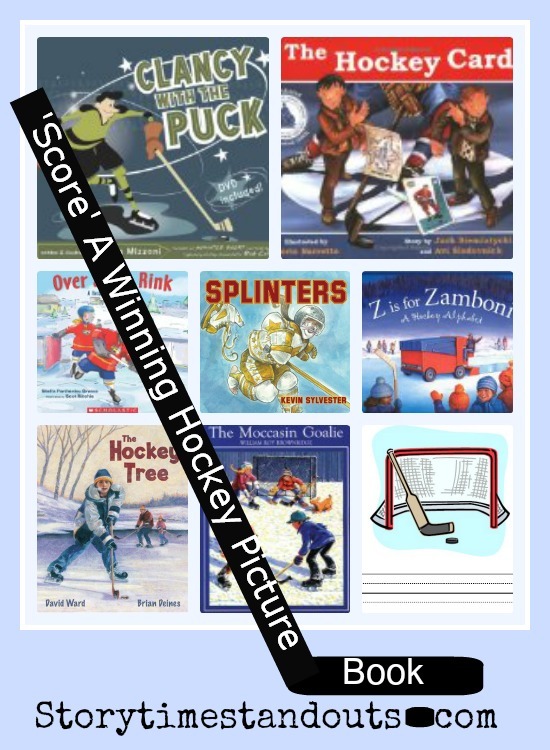 Hockey picture book (adaptation of a familiar song) published by Scholastic Canada Ltd.
Exuberant fun awaits in this hockey-theme adaption of Over in the Meadow. Young hockey fans will enjoy discovering all the elements of a great game – anthem singing, on ice- officials, a close score, players defending and scoring, earnest coaching, an enthusiastic mascot and excited fans. The wintry outdoor rink setting adds to the festive atmosphere. Good fun for children four years and older. Cindy loves to play hockey but it is an expensive sport to play and her family is poor. Showing great determination and resourcefulness, Cindy is excited to finally earn enough money to join a neighbourhood team. Unfortunately, at the rink, Cindy encounters three nasty Blister Sisters who make playing hockey very unpleasant. At her very first practice, she met the Blister Sisters. They could tell she was one good hockey player, and they were jealous. Thank goodness Cindy has a fairy goaltender watching out for her. The fairy’s magic provides Cindy with a dazzling new uniform, gleaming skates and a Zamboni – to transport her to the all-star team tryouts. Cindy rushes to the rink and does not disappoint – she is a star. Knowing that the magic spell will end once the final buzzer has sounded, Cindy rushes away from the rink, leaving a shiny skate behind. Coach Prince is determined to match the shiny skate to the player who wore it during the tryouts. Coach Prince went from locker room to locker room, trying the skate on every girl she could find. Finally she arrived at Cindy’s rink ensuring a happy ending for Cindy and her new team. Splinters will have greatest appeal for children who are familiar with Cinderella. We love the idea of taking a familiar story, like Cinderella and retelling it with new characters and a contemporary setting. In a primary classroom, we suggest using Splinters as a jumping off point, inspiring young writers to imagine other situations for Cinderella to encounter. 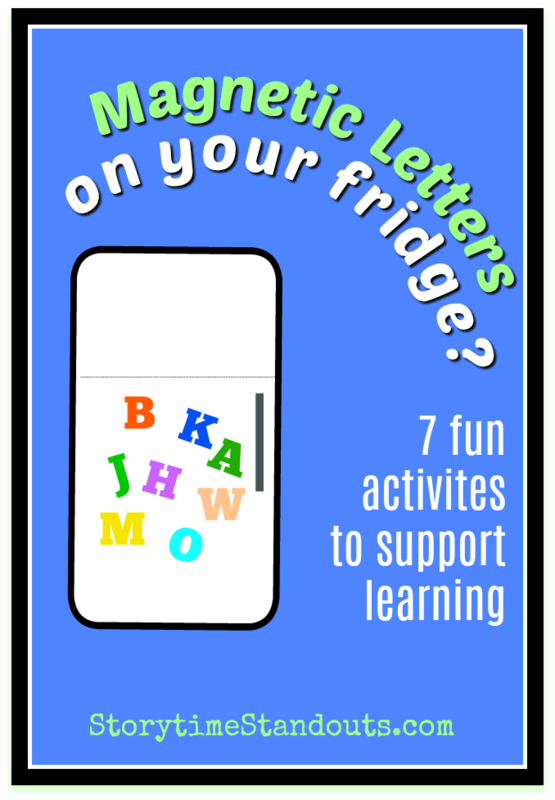 This is a very simple-to-make yet effective letter recognition game. 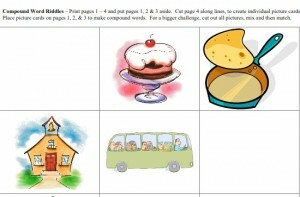 I use this activity with small groups (of up to twelve children). Each child receives one canning ring and one page of laminated scrapbook paper. The scrapbook paper has a fairly large alphabet motif on it. In the pictured game, I used DCWV scrapbook paper. I am guessing that it has since been discontinued because I can’t find an example of it on their website. My Scotch® Laminating Dispenser is 8.5″ wide so I cut the paper to fit the laminator and I put Y and Z on the back of the game. The children sit in a circle and the preschool or kindergarten teacher shows the children a letter or calls out a letter (or letter sound). The children put their rings around the correct letter. It is very easy for a teacher to quickly survey the rings and correct any that are in the wrong place. This game alphabet learning game could be adapted to show the children an uppercase letter and have them locate the corresponding lowercase letter. 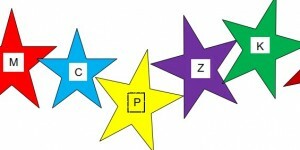 Alternatively, the teacher could make the letter sound and the children could locate the corresponding letter. I like the fact that it is easy to scan all of the children’s rings and quickly identify children who have chosen the wrong letter. 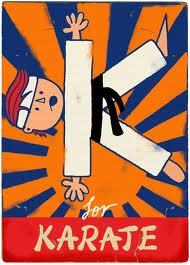 Follow Storytime Standouts’s board Alphabet Crafts on Pinterest. I have used both spelling/reading games very successfully with four, five and six-year-olds. Neither is appropriate for younger children due to choking hazard caused by small parts. We invite you to visit our page about beginning to read. 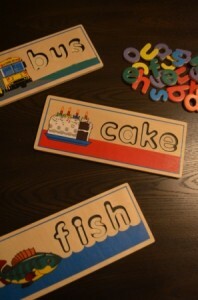 I recently purchased a Melissa and Doug See and Spell puzzle set for my Let’s Read Together program. 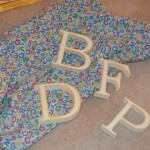 The set consists of 60 plus colorful wooden letters and eight, two-sided template bases. As shown in my photo (right), the sixteen words include long and short vowels as well as digraphs. I selected the Melissa and Doug See and Spell puzzle set because it is self correcting and it lends itself well to a group setting. When not being used in the template bases, the letters could be used to spell other words, they could be sorted by attributes or they could be put into alphabetical order. 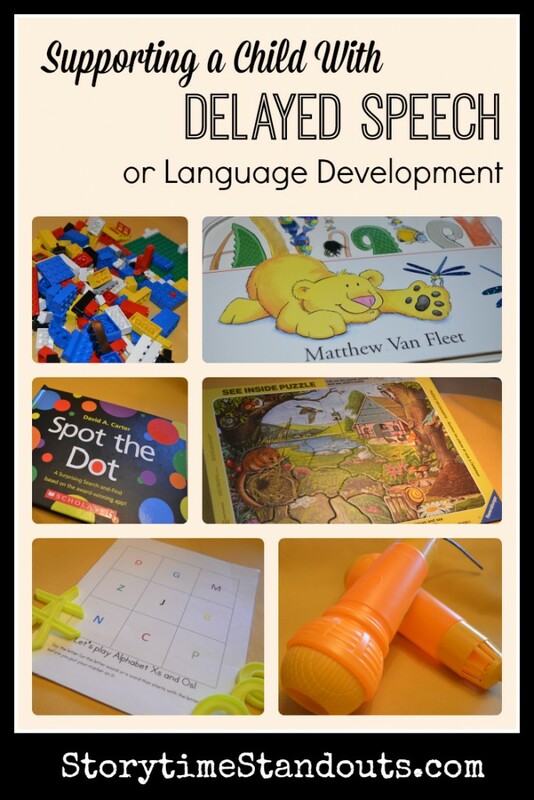 When one or more children play with See and Spell it is an opportunity to practice letter, object and word recognition, matching, fine motor skills and/or spelling. I have used a Boggle Junior game in my Beginning to Read program for more than ten years. 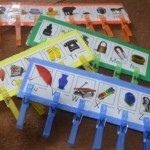 It is a great learning game for children who are learning to read and spell. 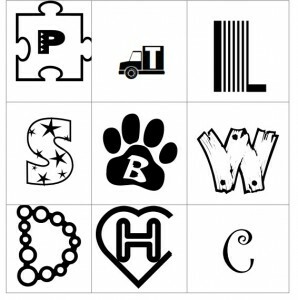 The game consists of a series of illustrated three and four letter words. The words and illustrations are printed on durable cardstock. To play, a child selects a card and spells the word it illustrates using three or four letter cubes. The cubes fit into a sturdy base. The child has the option of seeing how the word is spelled (and simply matching the letters) or attempting to spell the word correctly and then checking to see if he is correct. 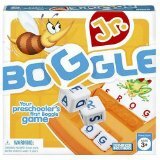 Boggle Junior can be enjoyed by one or more children. When one child plays with Boggle Junior it is an opportunity to practice letter, object and word recognition, fine motor skills, matching and/or spelling. When more than one child plays with Boggle Junior, playing the game becomes an opportunity to share and take turns. If two children are at different levels with respect to spelling and reading, one child could match the letters to correctly spell a word, another child could try to spell each word (without matching) and then flip a lever on the base to check the spelling. 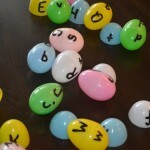 The Boggle Junior word cards include short vowels, some long vowels and a few digraphs (i.e. fish). Today was our second session of Getting Ready to Read Plus. Today’s theme was “Boats Afloat” and the letter of the day was “B.” The children were able to come up with all sorts of words that begin with the /b/ sound – bumblebee, bear, brown, blue, black, boat, boy, baby and more. 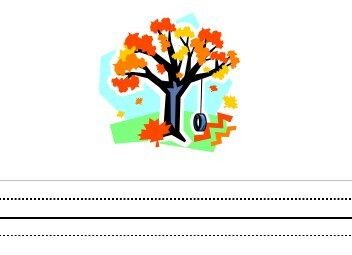 Boating theme interlined paper for beginning writers. 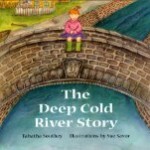 Our story today was The Deep Cold River Story, written by Tabatha Southey and illustrated by Sue Savor. 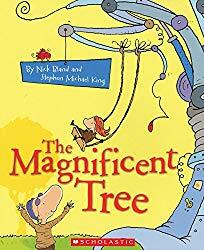 This is a very good read aloud for four and five year olds. I like using it with the “boats afloat” theme because there are several rowboats in the illustrations. Imagine a deep, cold river running through a small town. One day, for no apparent reason, the river overflows its banks and floods the entire community. Many possible solutions to the unrelenting flooding are proposed but it takes a little girl to solve the problem and save the town. 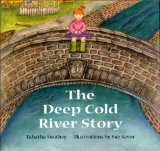 The Deep Cold River Story features a positive message about bedtime stories and offers a great opportunity for children to propose their own creative solutions to the problem. A charming story featuring a young heroine and appealing illustrations, The Deep Cold River Story is 28 pages and will be enjoyed by children aged 3 to 6. Featuring bright, bold retro illustrations, Paul Thurlby’s Alphabet is a stylish tribute to graphic design and each of the letters of the alphabet. Young children will enjoy the dramatic and distinctive artwork while learning about letter shapes and sounds. On the left side of each spread, we see a single letter in uppercase and lowercase form. The corresponding right side of each spread features an illustration that incorporates the shape of the uppercase letter and minimal text. Older children and adults will particularly appreciate the aesthetics of Paul Thurlby’s Alphabet, possibly using his ideas as inspiration for their own graphic artwork. Removing the book jacket and opening it reveals a gorgeous poster that highlights each of the illustrations from the book. Lovely. This is a great time of year to pick up the makings of an inexpensive, colourful learning aid – at your neighbourhood dollar store. 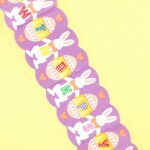 Easter merchandise is starting to appear and we want the multi-coloured two-part Easter eggs. Normally these are filled with candies but we are going to do something altogether different. We are going to use a permanent ink pen to print an upper case letter on one half of an egg and and the corresponding lower case letter on the other half. Children really enjoy searching through the ‘broken’ eggs. 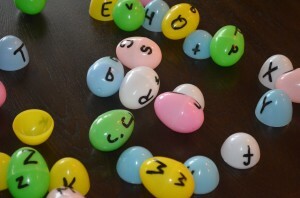 matching upper and lower case letters, ultimately assembling twenty-six whole eggs. I like the activity because using five or six colors makes finding a match fairly easy and also makes the activity somewhat self-checking. 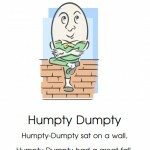 For older children, compound words, rhyming words or antonyms could be used. 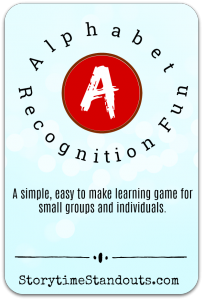 For more ways to help children learn the alphabet, check out our fee alphabet printables and our page about alphabet recognition. A word of caution: This activity is not intended for children younger than age 3. Also, to ensure the activity is safe, please use eggs that are large enough to eliminate a risk of choking. The U.S. Consumer Product Safety Commission has determined: ‘Any ball with a diameter of 1.75 inches (44.4mm) or less that is intended for use by children younger than 3 years of age is banned.’ This is an excellent guideline – please check the size of the eggs before purchasing them. I made a presentation last night to a preschool parent group. 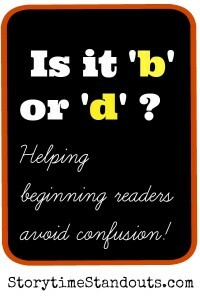 One of the topics of discussion was how we can help children avoid reading a “b” as a “d” and vice versa. At the presentation, I was not addressing serious learning challenges like Developmental Dyslexia ( a condition / learning disability which causes difficulty with reading and writing). We were discussing ways to assist children with letter recognition and b d confusion. 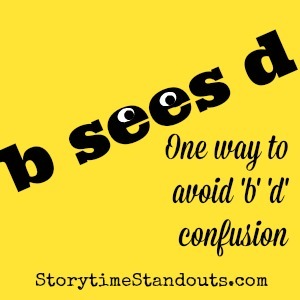 We talked about a few ways to help children correctly identify “d” and “b”. “This is the dog, and this is the tail, together they make a “d”. (Visualize c+ l = d, where “c” is a dog and “l” is its tail). 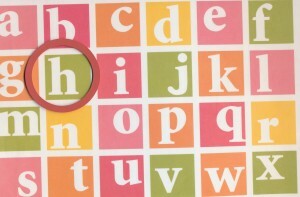 The technique involves examining how we print the letter “d”. It looks much like a “c” with a “l” added to it. Using this method, we discuss the fact that c + l = d and “d” is after “c” in the alphabet. Method #4: Bulldozing a b works! If your child knows that bulldozer begins with ‘b,’ he can use a toy bulldozer to push a letter ‘b.’ Letter ‘d’ is not nearly as cooperative because of its shape. 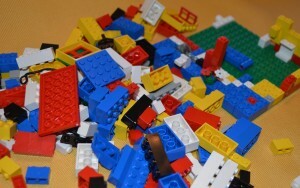 My favourite memory device is to make a “bed” with the child’s fingers. 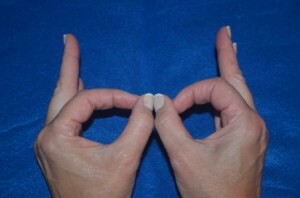 Imagine making two small circles with the thumbs and forefingers, and pointing the remaining fingers upward. Push the two circles together to make a “bed” (minus the “e”). 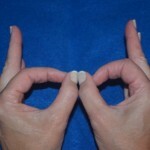 The left hand makes the “b” and the right hand makes the “d.” It looks like this: “bd.” “b” is at the beginning of “bed,” “d” is at the end of bed. Note, these methods will not work with very young children. With Method 3 especially, the child needs to know how to spell ‘bed’ in order for this device to be effective. From my perspective, with very young children, we should not worry about the occasional reversal. We can simply say, ‘That is a b. 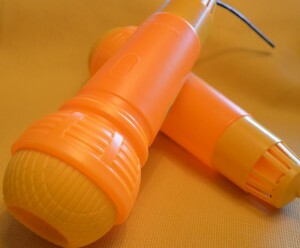 It makes the /b/ sound.’ With children who are starting to read, I find Method #3 to be very effective and easy to remember. I have seen children as old as seven do a quick check (underneath a desktop or tabletop) and then read a word with confidence. Follow Storytime Standouts’s board Alphabet Activities including b d confusion on Pinterest. If you know memory devices for b c confusion, I’d love to hear from you. Please jump in with a comment. 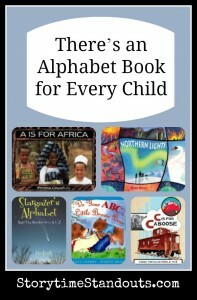 Alphabet books come in an amazing array of themes and formats. Whether your child loves rescue vehicles, solving puzzles, cooking or nonsense rhymes, there are alphabets books to explore and enjoy. 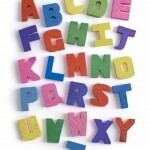 Note: For printable alphabets, The Alphabet Song and activities to help your child learn the alphabet. 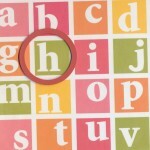 be sure to check out our Alphabet Recognition page and our Printable Alphabets page. Alphabet Explosion presents 26 challenging visual puzzles that will appeal to both youngsters and adults. With a full-page illustration and the number of things to ‘spy’ for each letter, you and your child(ren) could spend hours with this book. On the page for ‘S’, we are told to look for 47 things that begin with ‘S’. You might expect a snake – but would you recognize ‘slithering’ as well? Good luck! 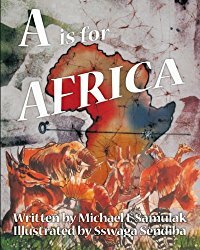 Fans of Audrey and Bruce Wood’s Alphabet Adventure and Alphabet Mystery will be delighted to know about this new concept book. The creators could not have picked a more appealing storyline than to have the ‘little letters’ build their own fire truck. When the ‘big’ fire truck breaks down, it is up to the ‘little letters’ to come to the rescue and put out a fire in the letter-making factory. 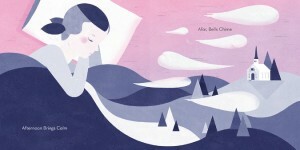 Beautiful illustrations have so much to offer those learning the alphabet. Here’s a serving of veggies that will appeal to even the pickiest eater. Big, bold illustrations of familiar (apple) and not-so-familiar (jicama) fruits and vegetables make for a delightful alphabet book. Reading it might convince your child to sample something new and vitamin-rich, possibly the whole alphabet! In the Style of Dr. Seuss, here we meet Tiny DiTerlooney. He warns us that we ought to “say good-bye to boring books where bears can bounce a ball.” Instead, he uses delightful watercolor illustrations to introduce twenty-six highly original ‘Creachlings.’ Lots of fun – especially for older children who will relish an all-new take on the alphabet. 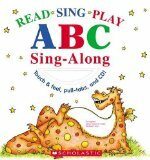 Twenty-six sing-along songs, with mostly familiar tunes offer a fun introduction to letter sounds and rhyming. Fun illustrations (including ten touch and feel textures & four pull-tabs) together with a pleasing CD make this a great resource for families and classrooms. 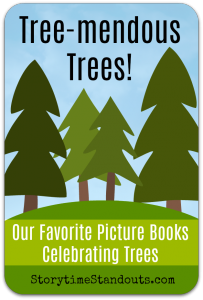 More excellent picture books you will want to check out! Alphabet Adventure is the story of Charley’s alphabet. The little letters are getting ready for Charley’s first day of school when Little I stumbles and falls. 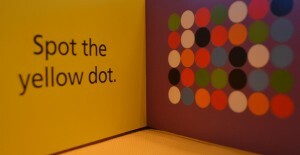 Although not immedicately noticed, Little I’s dot is missing. All the little letters scour Alphabet Island as they try to find the missing dot. An excellent choice for children who will soon be attending kindergarten, Alphabet Adventure’s bright, bold illustrations are great in a group setting but the hidden dot makes the book equally special for sharing one on one. 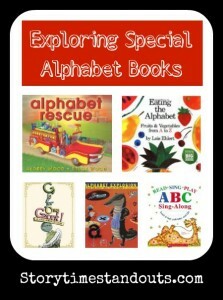 Once you’ve enjoyed Alphabet Adventure, be sure to look for the equally engaging Alphabet Mystery and Alphabet Rescue. I consider myself fortunate to live not far from the Pacific Ocean. Every summer we camp on the shore of Howe Sound and, even while at home, I am close to fresh salt air and pounding surf. It is almost impossible to walk along an oceanside beach without noticing something special. We’ve seen all sorts of shells, crabs, barnacles, mussels and the occasional tiny fish. When we venture further afield, we’ve been excited to spot starfish, sand dollars, jellyfish and more. I love beachcombing – especially with young children. Young children will thoroughly enjoy exploring If Rocks Could Sing and are certain to want their own collection of intriguing rocks. Share this with children aged three and up and you’re sure to be setting off on your own quest for rocks that sing. 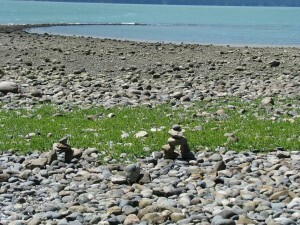 Note – photo was taken (by me) at Porteau Cove campground on the Sea to Sky Highway in British Columbia.